This post will be helpful for almost all of us who all are using an Android device. If you lose your Android device in which you have logged in to a Google Account, you can remotely locate your device and factory reset or erase your valuable information on your phone or tablet. So that at least your valuable data will be secured from wrong hands. Now a days most of the things has come down to your finger tips by means of a smartphone and associated applications. You might have installed facebook app, any banking apps like Citibank Mobile app(or any mobile banking app), e-mail client apps, Valuable contacts, your personal data or files or pictures etc. and you can’t imagine how badly your social life or personal life may be damaged. So here there is a way to save your data residing in your Android device when it is lost, not by using any of the third party applications but by using built in Google features only. Here I am going to guide you how to set-up Android Device Manager in your Android device and how to use it. Setting up android device manager is really very easy. Open Google Settings from your device’s apps menu. Remotely locate this device: Remotely locate a device and find its approximate location on Google Maps. For devices running 4.1 and higher, location access must also be enabled. To turn it on, go to Google Settings > Location > Access location. Allow remote lock and factory reset: Remotely lock or erase all data on your device. You can also change the lock screen passcode. Touch this option, then select Activate to turn on the device administrator. STEP 1: Sign in to your Google Account on android.com/devicemanager. If you’re using a Google Apps account, you will sign in to your My Devices page. All devices associated with your Google Account will receive a notification to enable it if it’s turned off. STEP 2: If you have more than one device, select the arrow next to the device name to change it. To rename the device, use the edit icon. When your device is located, its approximate location is indicated by a blue circle on the map. The device manager also displays the name of the place where the device is located, the time it was located, and when it was last used. Ring: Ring your device at full volume for 5 minutes – even if it’s set to silent or vibrate. Lock: Lock your device with a new password. Erase: Perform a factory reset, which permanently deletes all of your data. – Your Android is running Google Play services version 3.2.25 or higher. STEP 1: Open Google Settings from your device’s apps menu. STEP 2: Touch Android Device Manager. 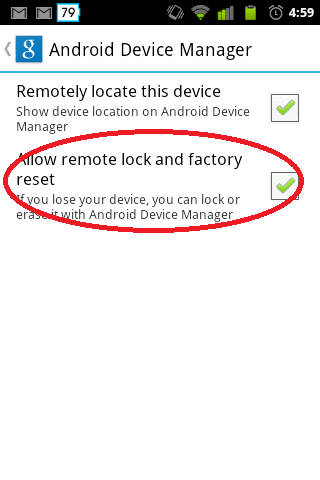 STEP 3: Uncheck Allow remote factory reset. 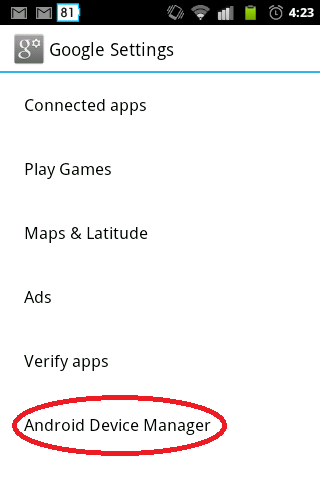 STEP 4: Go to your device’s main Settings menu, then touch Apps > All > Google Play services. 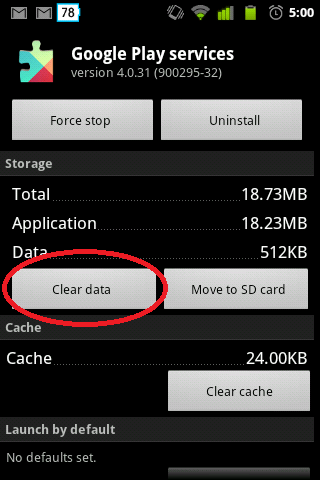 STEP 5: Touch Clear Data. Note that this action doesn’t remove personal data. 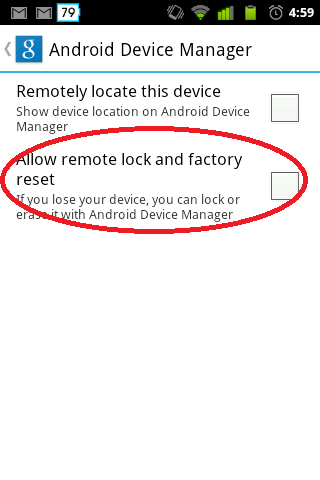 STEP 6: Go back to Google Settings and select Allow remote lock and factory reset. NOTE: If your device is offline, Android Device Manager won’t be able to ring, lock, or erase the device until there’s a mobile data or Wi-Fi connection. Select any of the options in advance, and the action will be performed once the device is back online. Android Device Manager won’t work for devices those are powered off.